Axis Of Oversteer: Time for Daniil Kvyat to get a time out. Time for Daniil Kvyat to get a time out. Romain Grosjean was made to sit out of F1 for a race in 2012 for similar stupidity. Kvyat hit Vettel's Ferrari twice, possibly three times in the space of two turns at the Russian GP in Sochi. It looked like a drunken Russian dash cam video, one contact is a mistake that can happen, two is sheer stupidity. 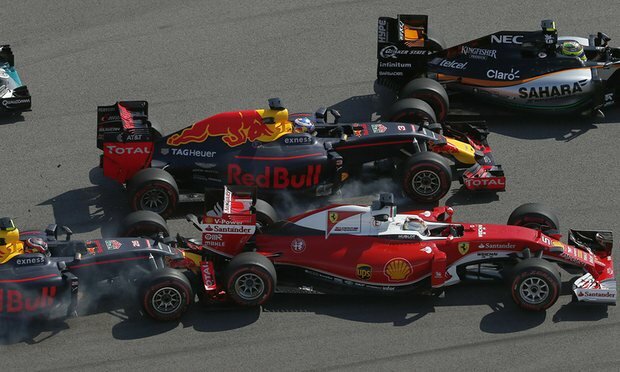 Imagine the crash if the Toro Rosso on the right had not managed to avoid the out of control Russian. Still think putting a windscreen on cars is the most important safety priority? Time for Danil to get a time out.